Blueberries, strawberrries, brambles of all kinds, gooseberries and currants; we love them all! 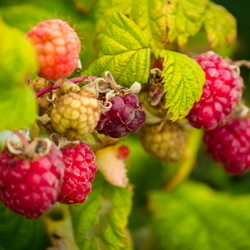 Berry plants are fairly easy to grow and make great additions to a backyard organic garden. While dormant, most berry plants do appreciate some minor care during the winter. Here's the rundown on winter maintenance of your berry patch. Winter weather is not for gardeners. We have few chances to enjoy the garden, and fewer timely tasks to call us out there. But some garden specimens need winter maintenance. Your berry bushes and plants are among them. No heavy duty work here, the job is just enough to give you a dose of fresh air, sunshine and "vitamin G" on a not-so-frigid winter day. Mulch and weed control are important to bountiful fruit crops. Mulch wards off those annoying, nutrient robbing weeds. It also regulates soil moisture, which is vital for growing juicy berries. Organic mulch does those things, and also gradually feeds the tiny organisms that build good soil structure and chemistry. Berry bushes and plants have shallow roots. These fine roots need protection from the elements all year round, not just during the growing season. Tend to mulch first and leave pruning for later in winter. Many cultivated plants perform better with pruning. Late winter is prime time for pruning berry bushes. A clear view of the bare branches makes the job easier. Prune to eliminate diseased and broken plant parts. 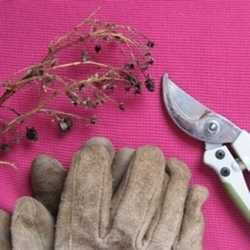 Prune to remove the overly vigorous growth of some plants, which add too many branches at the expense of big berries. 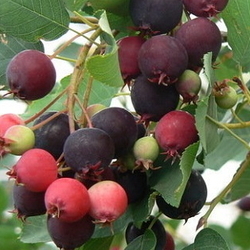 Mature berry bushes should be pruned to open the bush for good air and sunlight penetration and to encourage young, more fruitful, new stems. Young plants may only need pruning to remove damaged or diseased stems. Pruning recommendations vary by type of berry. Refer to the individual sections below to see just how to best trim each berry. Always remove and dispose or destroy all cut material, as it may contain traces of plant disease. Do not fertilize berries during winter. You may want to do soil testing (before mulching or adding organic matter) so you'll be ready to fertilize in early spring, and adjust pH if needed. Read "The (Dirt) Doctor is In" by Paul Rodman to learn more about soil testing. Individual berries have particular needs. These are described below. Weed by hand or very shallow cultivation, and maintain mulch layer under and around hills. Find canes that have fruited in summer and cut them off at the ground. You may have done this as you finished harvesting blackberries in summer. Cut off other skinny canes and leave six or so healthy looking strong growing canes per hill. In late winter, cut those off at seven feet long. Tie them to supports so they are spread out. Now cut off any weak side branches on those canes, and cut strong side branches off at 10 to fifteen inches long. Weed by hand and maintain mulch. Pine straw, shredded oak leaves, or a pine or oak mulch, are recommended to encourage the acid soil that all blueberies crave. Lowbush - Thin (cut to the base) up to half of older canes on mature bushes. Aim to open the center of the bush and eliminate any touching canes. Remove damaged or diseased branches. Rabbiteye and highbush - Tip-prune to control the height of the bush for easy harvesting. Thin (cut at ground level) a few older canes if mature bushes are dense. Highbush in zones 3 and 4 - The bushes grow more slowly in these cold zones, so prune less aggressively. Remove just a few old canes when needed to open the center of the bush and encourage new growth. Mulch well with organic material. They like cool rich organic soil. Gooseberries, red and white currants, jostaberries - Cut off, at the soil, any weak floppy canes. Do not tip prune. Mature bushes should add three or four healthy new canes each year; remove the same number to keep the bush under control. Prune back any side branches if you have not done so after harvest. Keep perhaps just nine or up to about a dozen strong stems per mature bush. Branches older than four years become less productive, so remove them. Black currants - Black currants bear crops on one year old and two year old wood. Remove any canes older than two years. Maintain a dozen or so strong canes per bush. Consider a fungicide application if powdery mildew has been a problem. European currants are most susceptible. Pruning for good air circulation helps reduce mildew. Weed and maintain an organic mulch layer on these low growing evergreens. Both like a moist, acid soil, so pine and oak mulches are recommended. Pruning is minimal, for the health of the bush if needed; remove broken, rubbing, or diseased growth. Weed the bed by hand or very shallow cultivation. Mulch with several inches of organic matter. Summer bearing red and gold - Take down support wires. Find just-fruited canes and cut off at ground level. Also prune to the ground the weaker canes until you have left the strongest looking 2 to 4 canes per foot of row. Cut out any sucker canes growing outside of the row. Tip prune the remaining canes to about 4 feet and reattach to supports. Fall bearing - Cut all canes to the ground now. This could be done anytime after late fall. The new berry crop on fall bearing old fashioned raspberries will occur on canes that grow up from the ground this spring. Purple and black - Find branches canes that had fruit this year and cut them at the base, as well as any dead wood and weak young canes. Of the straight canes remaining, leave up to six of the best. Remove the rest. Cut the sx strong canes down to about two and a half feet. Pull weeds by hand. Let the ground feeze, or the plants feel a few frosts. Then mulch all over with 4 to 6 inches of loose straw or pine boughs, or a floating row cover. A persistant snow cover makes an effective strawberry mulch.